For airfare geeks like us, one of the exciting things about the start of the year is that you can finally start looking at a complete set of flight data that includes a full 365 days. In 2012, our servers compiled a whopping 560,611,868 fare search records and we spent the first week of 2013 combing through that data, trying to find an answer to the the most frequently asked of all frequently-asked-questions: how far in advance should I book my flight? Well, we sort of have an answer. It’s 49 days. 7 weeks in advance. But we have to qualify it by saying “on average“. Of course, a million caveats apply and this is all based on averages from a year’s worth of dates in over 11,000 purely domestic markets. For any given flight, the actual best time to buy might vary, depending on the market, the time of year, the day of week, and other factors (more on that below). But if you’re looking for a short answer and a simple number, 7 weeks is the best one we’ve got, based on the 560 million searches we analyzed. Not surprisingly, as you can see from the graph below, the worst day to buy a ticket was the day before the flight, and 2 days in advance was the second worst, 3 days in advance the third worst, etc. until you get to 11 days out. After that, the next worst day to buy was actually a tie between 208, 209, and 210 days in advance — which are the furthest out we went with this analysis. What does this all mean? The simple fact is that the way to get the worst airfare last year was, in most cases, to buy your ticket really late or really early. If you look at the trend line beginning at 7 months out, you’ll see fares started out high and steadily decreased as you got closer to a flight date, hitting rock bottom at around 7 weeks in advance. At that point, they started to increase a tiny bit, but they stayed pretty steady until about 1 month out. Then they started to spike pretty dramatically. The 7 weeks in advance was based on domestic fare data only. For international flights, it was still not good to buy too early or too late, but the sweet spot there was about 11-12 weeks in advance. (The exact low point was 81 days). For extremely busy travel periods like holidays, buying further out was usually better. 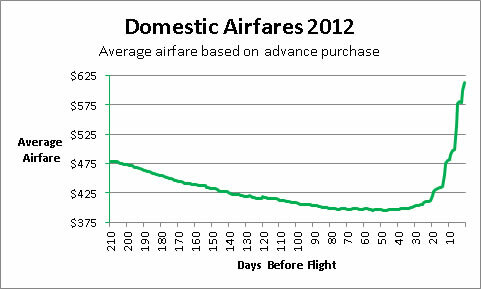 For Thanksgiving 2012, for example, the optimal day to buy was, on average, 96 days before a flight. That’s almost 14 weeks in advance. Although the averages we mentioned are real, for practical purposes, its best to take this information as a guideline and not a rule. When you drill down deeper into the data, you see a lot of variation from market and trip to trip. For instance, even though on average 7 weeks in advance was the best time to book, we found plenty of combinations of origin, destination, departure, and return dates where the best fare was actually found 1 day before the flight (like L.A. to Tokyo on October 3, returning October 10). We also found a bunch of examples where the best day to book was the day the flight opened for sale, 331 days in advance. Austin to Auckland December 19th through December 26th was one such example. The lesson is that there continues to be an unpredictable element to airfare pricing which, if you’ll indulge a shameless plug, is what makes CheapAir.com’s unique Price Drop Payback offer so valuable.